Would u like to collaborate with YuuGuu? When I was at an event organised by FirstCapital event before Christmas, I met with two guys who told me about a new service they were launching – YuuGuu. I’m sure I probably said something along the lines of “What was that again?” By way of explanation, according to their web site, Yuuguu derives from the Japanese word for fusion. Put simply, YuuGuu is a web-based collaboration service that helps teams work together. I first used such services in the mid 1990s when Intel’s ProShare came to market and have been using them occasionally on and off ever since. Collaboration services are now widely used as we all know (I have listed here some of the companies offering web based collaboration services). There is a wide variety of tools that come under the heading – some are used more than others. For example, Instant messaging (IM) has become part of all of our lives, although there is still resistance from many companies in allowing their employees to use them due to security considerations. Skype is all about voice collaboration and makes an excellent audio bridge for conferences – if there is a sufficiently good Internet link to allow it work correctly. Video conferencing is still an expensive, unreliable and a black art if my experiences over the last decade are anything to go by. Personally, I would rather have a good audio conference than a four foot video screen where you cannot see the faces of the participants clearly because of the quality provided by a 2mbit/s link. The other interesting component of many web collaboration services, is application sharing. Application sharing is the ability to remotely access and interact with an application on a remote machine. This was seen in Intel’s Proshare and formed a component of Microsoft’s NetMeeting for example. My most recent use of such software was using the well known webex service last year to show presentations and demonstrate some network software to potential customers around the world. This generally went well (though webex is certainly not the easiest service to use) but is was being used in what I would call a non-interactive one-way manner i.e. Internet delays were not that important unlike if you were editing text remotely. My experience of doing just that has been this year when I attempted to use my blog host’s on-line HTML editor. This was a complete disaster as I lost much text when the web page failed to update correctly several times. However, this was designed for remote use as you were editing on your own machine before uploading. If you attempt to edit documents on a remote machine that are not designed for remote access such as Microsoft Word and PowerPoint , high latency on key presses can be disconcerting and disrupt thought flow. This type of application sharing demands good Internet performance with zero packet loss. My first interaction with the software was with it availability flag described thus by YuuGuu as “Presence – instantly tell when your workmates or friends are around”. In practice, this is a simple indicator that you can set in the client to say whether you are available or not. I will be writing quite a long post on presence’ in the future so I won’t dwell on the subject too much here. YuuGuu will be adding more capabilities to this simple availability feature in the future. They do use XMPP so at least they will be able to interconnect or federate a buddy list with other IM services. YuuGuu is very straightforward to install and start and my first call was with Philip Hemsted and with a click of a button and with his permission I was able to see his desktop. At the moment you can only share a complete desktop and cannot specify just a single application so there could be security concerns if you are giving access to somebody who is not is the same company as yourself. Philip went though a couple of PowerPoint slides and then I asked to access his copy of Word to do some remote editing. This went fine but there was around a two second delay when typing so I couldn’t recommend that you start writing the second War and Peace but this is typical of most remote access programmes. The better you are at touch typing, the easier you will find it to use! 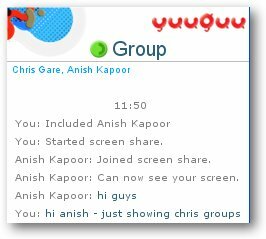 One really nice feature is its group capability. You can call in a third party to the collaboration session by selecting them from the buddy list and they will be able to see the shared desk top as well as become part of the YuuGuu IM session. 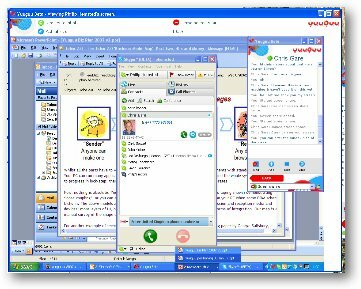 I’m sure that in most collaboration sessions Skype would be used in parallel so a VoIP capability would be a beneficial future addition. There are lots of plans to upgrade the current service with additional capabilities that would be required for corporate use such as history storage for their audit needs and SLAs. These would most likely form the basis of a future paid-for premium service. What makes the product interesting to me is the simplicity of its use, its ability to work on an Apple in addition to Windows and its simple group capability. Go try – you have nothing to lose! Interestingly, like Crisp Thinking, they are based in the the north of England – Manchester. This entry was posted on Wednesday, March 7th, 2007 at 12:46 pm and is filed under All, Company reviews, Internet, Product reviews. You can follow any responses to this entry through the RSS 2.0 feed. You can leave a response, or trackback from your own site. 4 Responses to Would u like to collaborate with YuuGuu?